Each year sudden cardiac arrest (SCA) strikes approximately 340,000 people in the U.S. alone. The majority of these people have no warning, since they show no prior symptoms. And sadly, fewer than 5% survive, often because emergency medical services cannot reach them in time. SCA most often occurs when the electrical system of the heart becomes chaotic, causing it to stop beating effectively. Lacking proper blood flow, the person loses consciousness, stops breathing, and will die unless promptly treated. CPR is important, but it alone cannot restore a normal heart rhythm. A “shock” from a defibrillator is the most effective way to restore the heart’s normal pumping rhythm. The victim’s best chance of survival is to receive that shock within 5 minutes of collapse. Just as seat belts or airbags do not save every life in a traffic accident, a defibrillator will not save every person who suffers a sudden cardiac arrest.Yet many lives could be saved if more people could be reached more quickly. Philips Heart Start Defibrillators enable virtually anyone to treat the most common cause of SCA quickly and effectively, wherever it happens — at work, at play, in the air — providing the power to save a life. 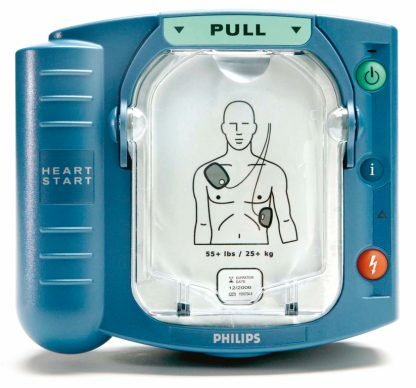 Philips, the leader in portable defibrillation technology, designed the HeartStart OnSite Defibrillator for the ordinary person in the extraordinary moment. 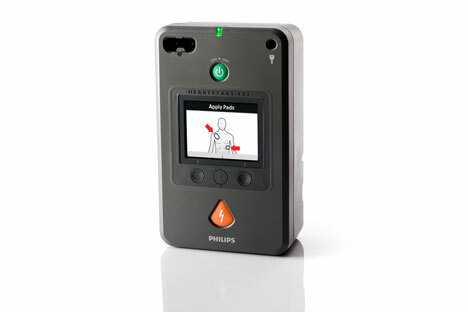 Available without a prescription, the OnSite is designed to be the easiest to use and most reliable defibrillator available. 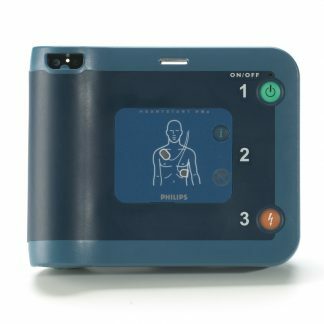 Our innovative technology, based on extensive research and user feedback, has produced a defibrillator so easy to use that you can potentially save the life of a co-worker, friend, or anyone else stricken with sudden cardiac arrest. Weighing just 3.3 lbs., this small and lightweight defibrillator can be easily carried to the victim’s side. Using clear, calm voice instructions, the OnSite Defibrillator guides you through each step of defibrillation, including CPR Coaching. Integrated SMART Pads placed on the victim’s bare skin transmit information to the defibrillator, which senses and adapts to your actions every step of the way. Heart Start OnSite includes proven Philips technologies for heart rhythm assessment (SMART Analysis) and defibrillation energy delivery (SMART Biphasic). And like all HeartStart Defibrillators, it can be used to treat adults, as well as infants and children.